A superior electronic bill presentment and payment solution can support banks or third-party service providers to create convenient payment channels for consumers and make their lives easy. Banks need a cost-effective solution supported by timely, secure and accurately processing to handle the financial flows between the customer, the bank, the utility companies, bill concentrators and other bill providers. Getting it rights means an increases customer satisfaction and loyalty. It also will offer additional fee possibilities, marketing data, reduction of costs and cash flow benefits. Utility Payment Processing is an end to end easy and powerful bill payment system. 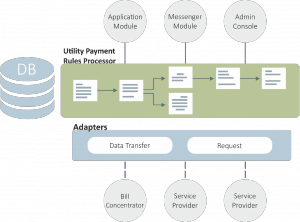 The software facilitates, manages and create financial flows between the customers of the bank, the bank and bill providers. Payments and related remittance information are aggregated from all channels being utilised and are sent electronically through a single interface stream, in the agreed upon format and at the agreed processing period. The UPP software can be easily integrated in the existing E-banking environment and provide excellent integration possibilities with existing front-end bill payment functionality.